All SAMICS Concepts are structured into a modular level system. Generally this consists of Levels 1-6 for students with Level 6 being a “black belt” and a corresponding instructor grading from Levels 1-12 with Level 12 being a “Head Instructor”. While all SAMICS Concepts share an underlying structure and didactic methodology and many training ideas are common to all training schedules each system has its own specific elements unique to itself. 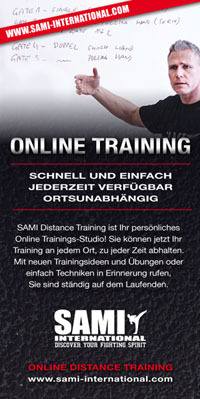 Focus on these unique elements within each system coupled with easy interchangeability within SAMICS Concepts allows practioners to achieve a level of martial arts expertise difficult to find elsewhere. For example: The Knife Fighting Concept system focuses 100% on training either with, or in defense against, a knife aiming for expertise in this discipline. Nevertheless, due to the common origins, methodology and training techniques inherent within SAMICS, practioners will find cross-over into other weapon-based SAMICS Concepts or even an empty-hand system like Panantukan Concept seamless and easy.